( http://www.spitfireonline.co.uk/popup/exhibit9.html ) where we take good care of his Sandringham flying boat. I gave a flight deck tour today when we reminsced about the period in Charles Blair's ownership. ""The most recent of many tributes to Captain Blair was the unveiling of a memorial in his honor at Heathrow Airport in London, terminus of his 1951 record-breaking transatlantic flight. Consisting of a large-scale replica of his famous Mustang, Excalibur III, the memorial was dedicated on January 30, 1981. Present at this ceremony were Captain Blair's widow, who performed the unveiling; representatives of Pan Am and other companies; aviation notables; the press; and many of Captain Blair's friends. Plaques located near the memorial give the highlights of Captain Blair's career and constitute a permanent record of his achievements. This memorial was made possible by contributions from Captain Blair's friends and fellow employees of Pan Am."" Can anyone help me locate this memorial? I would very much like to visit it, but cannot find any mention of its location at Heathrow. Does anyone know which building it is in? Does it still stand? Last edited by Corsairoz; 14th May 2008 at 23:40. As far as I know it is on the roof of the Queens Building, clearly visible on Google Earth. The roof used to be part of the viewing area but unfortunately there is no public access anymore. It could be seen when walking from Terminal 1 to Terminal 2, not sure it that is still the case. The area is due for demolition to make way for Heathrow East. If they are demolishing the Queens Building to make way for Heathrow East, I hate the idea of losing this memorial forever. I would love to talk to someone about the possibility of moving the Memorial for Charles Blair (the P-51 Excalibur III) to our Museum, where we are taking good care of Charles Blair's Shorts Sandringham (our Flying Boat's sister was Excalibur VIII). Anyone know who I should contact at Heathrow? or BAA? Last edited by Corsairoz; 14th May 2008 at 23:42. I was at the official unveiling of the red P51 memorial to Capt Charles Blair as I worked for Pan Am and met his widow Maureen O'Hara. I understand that she currently lives in St Croix US Virgin Isles and may still have an interest in Antilles Air Services if it is still operating Perhaps she should be contacted as well if the memorial is being consudered for relocation. I would be inclined to contact the BAA General Manager at either Terminal One or Two. Don't hold your breath though, my experience of dealing with BAA management over the past thirty years has led me to the conclusion that it is run primarily by pen pushers and bean counters who have very little interest in aviation for its own sake. I could use stronger language but I would be banned. I flew on the Sandringham back in the 70's when Charles Blair brought it over to the UK. The aircraft did pleasure flights around the Isle of Wight taking off from and landing back on the Solent.It was a fantastic experience, during the flight we were allowed up on the flight deck which if I remember correctly was huge.While up there Maureen O'Hara was there selling tee shirts, I bought a nice Antilles Airboats tee shirt which I proudly wore for several years until it started to fall apart. P.S. After his death in a crash didn't it come to light that he had been fiddling the maintenance records of his aircraft for years?. The accident report was published in Aviation Week, and if I recall correctly, a cylinder head had been released (R-985 on the G-21A Goose) causing a partial release of the engine cowl. The resulting drag made it impossible to hold altitude OEI, even in ground (water) effect. Right now I cannot find the complete report online. I was on the same flight around the Island flying from Calshot. I remember being on the Flight Deck when we did a low turn around the Isle of Wight ferry....a brilliant experience, and I too bought a Tee from Maureen O'Hara. The aircraft lasted longer than the Tee. I have a fantastic time each weekend giving folks flight deck tours of the Sandringham (now reverted in identity back to 'Beachcomber' from its Ansett days) in the Museum. Yes, the flight deck is huge, 5 working up there in flight and still room for more. Link earlier in the thread. She is in fantastic condition and the only Sunderland or variant in the World where the public are allowed (supervised by my colleagues and I) onto the flight deck. 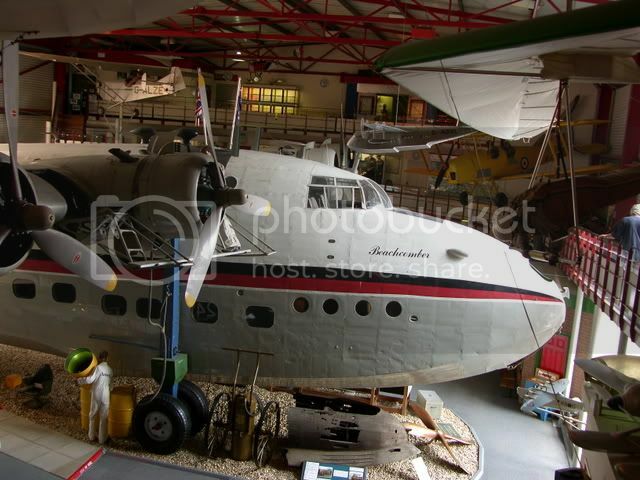 If anyone wants to come and visit Beachcomber...I will be working at the museum for the next 3 Saturdays, ask for Trevor and we can chew flying boat cud in the flight seats. on 02 Sep 1978. It makes sad reading. I confirm the Blair P-51 memorial is still (on 11 May) in position on roof of Queens Building at LHR and my be seen from corridor linking T1 and T2 . It was unveiled on 30 Jan 1981 by Maureen O'Hara Blair. also managed a few flights out of Dun Laoghaire Harbour in Dublin Bay. Lake-Boston Harbour-St. Thomas/St. Croix. An Atlantic crossing at 500ft or below and 125kts was "different"
Incidentally there is an Exhibition "Sydney's Golden Age of Aviation"
Museum of Sydney, Cnr Bridge & Phillip Streets, Sydney until 14 Sep 2008. Just to let you know the model is now gone, I know not where. Well, I tried. Probably 10-12 phone calls to seemingly all of BAA. Only twice to humans, And only spoke to one human who even recognised the memorials existence. Ah well, maybe in the next life.....Thanks for the info. Didn't his boy Tony do well though. The fixture is not there above QB and with the Visitor centre gone it seems that LHR / HAL has little room for any memorials to anyone. That was summoned up with the lack of anything celebrating our hsitory @ T5, unless I missed it. When I passed through Heathrow in Jan 2009, I looked in vain for the memorial but it had been removed, although the placard was still affixed to the windows of the pedestrain corridor between T1 and Queens Building. However the mystery was solved when I picked up a copy of the Heathrow Staff newspaper where there was an article indicating that it had been sent to Westway models for refurbishment following which it would be sent to Dublin on the instructions of Maureen O Hara. Where is it now ? Maureen O Hara is patron of the Flying Boat Museum at Foynes on the Shannon which has some Charles Blair material, so maybe thats where it is headed for. I too flew in Blair's Sandringham during it's visit to Ireland, and also flew Charles Blair around Galway Bay and Lough Corrib to identify potential landing sites for the Sandringham. While in Ireland it operated on Aer Arann's AOC, and I was lucky enough to fly in her from Lough Derg (Killaloe) to Glengarriff, where the Blairs had a property. During the outbound flight Maureen O'Hara dispensed hospitality from the small bar in the upper aft cabin. 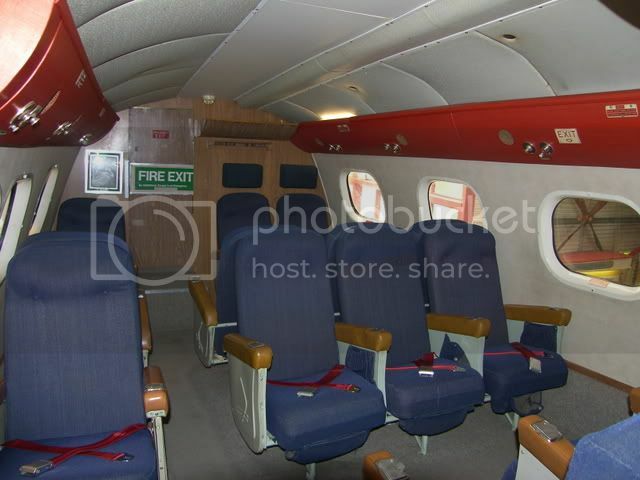 On the return flight to Killaloe I was lucky enough to get one of the jump seats, the other was occcupied by Capt J.C. Kelly Rogers, another old flying boat man who had flown Churchill back to the UK from the Bermuda conference in a Boeing 314. It was an unforgettable experience to watch these veterans faces during the flight. I have a photo taken on the flight deck as she turned finals to Lough Derg, but can't suss out how to post it here. I was also lucky to see the Sandringham take-off from the Aran Islands from the air, and fly in loose formation with her for a while as she set course for Killaloe - magic! I must try to get to Solent Sky soon! I have contacted Westway Models to try and get an update on this model. However, the owner unexpectly died recently and I now await a response from the current manager and will post here again when I get one. In January 2009, the Memorial was removed from the Queens Building and sent to Westway Models for refurbishment. It was then to be returned to Maureen O'Hara in Ireland, as far as I know. I can confirm that Excalibur is proudly displayed at the Foynes Flying Boat Museum here in Ireland where we are also fortunate to have a magnificent collection of Maureen O'Hara treasures..